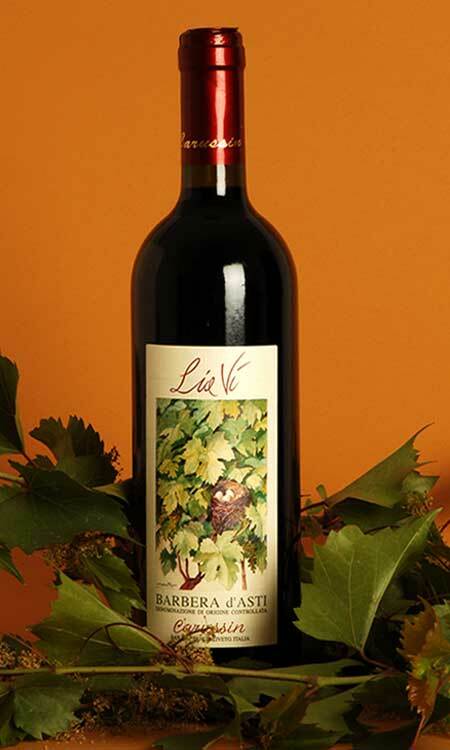 Lia Vì is the characteristic Barbera d’Asti, young, intense and fun. Vineyards: Town of San Marzano Oliveto. Pruning system is Guyot. Planted in the year of 1981. Working techniques in the vineyards: Pruning leaving 7/8buds. Activities in the vineyardsare guided by a modern Biodynamic method, vineyards are certified organic by “Solo e Salute”. Manual grass mowing. Lia Vì is made with soft pressing, controlled fermentation and average maceration, wine is pumped over circa 3 times a day, wine becomes steady naturally during ageing. Short ageing in concrete tanks. Longevity: 10 to 12 years. Lia Vì is the characteristic Barbera d’Asti, young, intense and fun. Its name was born from the research of the various natural bird nests, compared to the other vineyards, that are found in its vineyard in the period of pruning. After a research lead by technicians, it was concluded that those nests are made by a migrating bird that stops by that vineyard during its rout. The technical name of such species is Muscicava Parva, in Piedmontese dialect it is Lia Vì. It is a wine that pairs with important entrances, spicy first dishes or light second dishes.